Clowns are just legitimately scary to some. Clowns are often responsible for providing the public with plenty of nightmares. Something about those bizarre grins, those colorful hairstyles -- it's unsettling. And just thinking about clowns hopped up on energy drinks. Those are quite possibly the scariest of them all. So what do you do when you've got these freaky clowns running around everywhere? You pelt them with projectiles, of course. At least, that's the case with Clowns in the Face, a silly little app that finds you abusing these pesky clowns with tennis balls as a former pro tennis player who's had just about enough. Can you blame him? As the star tennis player plagued by clowns loitering around the city (standing there looking sad and annoying) it's your job to send tennis balls hurtling into the sadsacks in order to rack up points. This is accomplished by aiming via touch screen, holding down, and then releasing to fire. Accuracy is key, and if you can hit more than one clown in your line of sight, that's even better. The better your aim, the more tennis balls (out of three) you can potentially earn. Between each round an ad (as the app is free) and a brief newspaper reel via the "Circus Times" relay the information about the clowns causing bedlam in the city. The clowns, "high on Explodz energy drink" continue to harass customers, and it's extremely silly to follow, but here that kind of plot line works well. Levels are selected via a large Bingo-like board as your tennis player advances. Sometimes instead of just smacking clowns with tennis balls there are smaller puzzles that may be solved by aiming for balloons or other obstacles to release Explodz gas or other components necessary to complete the level. This requires strategic bouncing of course, and each level varies in difficulty. There's a good amount of variety as you advance through the ranks, and it becomes harder and harder, but never frustratingly so. It's a refreshing progression that feels natural, and it's sad to see the levels eventually have to come to an end. You'll power through the levels quickly and some end up feeling a little tired after completing more intuitive stages at first, but there's still enough to do to keep you on board until the end. Watching the tennis balls bounce to and fro, and whacking clowns in the head and back is actually pretty engaging, and a surprisingly competent exercise in aiming and shooting. It brings to mind the more precise turns of Peggle and those crazy days of many a youth who couldn't stand the thought of clowns standing at the foot of the bed overnight. Because you know that totally happened. What truly makes the game work is its charming artwork and personality. It's cartoony and gorgeous, and even the main menu itself is pretty zany on its own. Pressing the two signs on the building on the main page finds a few boxes falling down in a random pattern to the ground, from which you can look at the newspaper segments, game settings, credits, and so on. It's full of neat little touches like this that make it feel less like a basic free-to-play game and more polished than the norm, and that's likely we appreciated it the way we did. Clowns in the Face may as well be "tennis balls in the face," and it's actually an engaging and exciting game to be a free offering on the App Store. 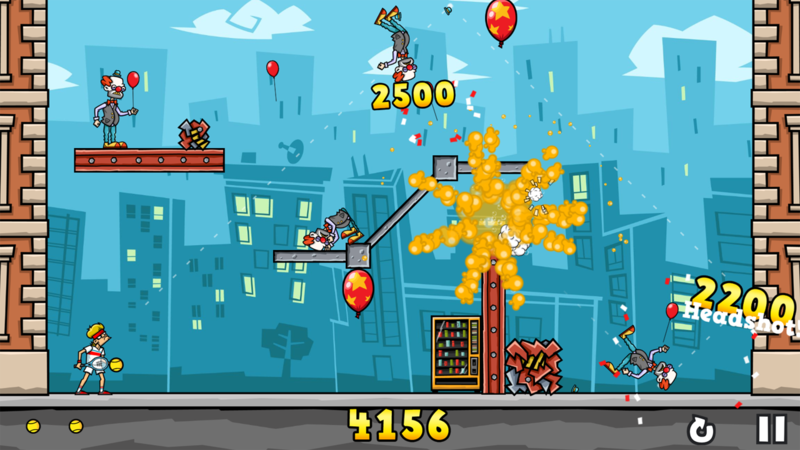 It's littered with cute touches and characters, and you get to actually hit clowns in the face with tennis balls. If you haven't been swayed by its other niceties, let that be one reason you check it out if nothing else.